Squishy balls, stress balls, koosh balls, hand exercisers… there are dozens of objects that can be squeezed quietly.Teacher tip: make sure that kids use them under their desks for minimal distractions to others. Fun activity idea: fill balloons up with different items (seeds, playdough, flour, etc.) to squish. Fidgets are small objects that help keep students’ hands occupied. You can buy these on Amazon.com or use objects like beaded bracelets, Rubik’s Cubes, or slinkies. Silly putty, playdough, or sticky tack can also keep students’ hands occupied. Tape a strip of the hard side of velcro under the student’s desk. It gives them something to touch. Many types of objects can work, such as emery boards or straws. 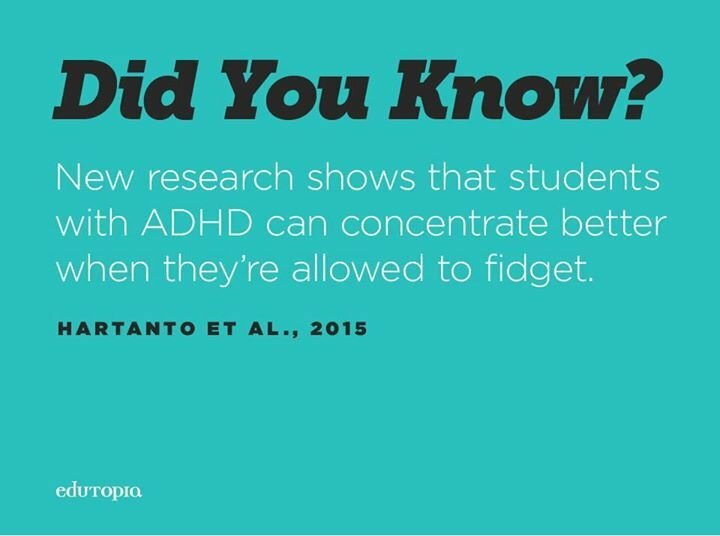 Chewing gum can help keep some ADHD students focused. In no-gum classrooms, necklaces with chewable pieces can also work. You can also wrap airline tubing or rubber bands at the ends of pencils for students to chew. Doodling can help many students focus, not just ones with ADHD (here’s the research if you’re interested). Some students also benefit if they can draw during storytime or a lesson. A fan in the back of the room can help some students focus. Letting them listen to music on headphones (as long as it doesn’t interfere with what’s happening in class) can also help. One teacher had success with an aquarium in the back of the room — the students liked hearing the calming swish of the water. Tie a large rubber band (or yoga band) across both front legs of the chair for students to push or pull against with their legs. AKA yoga balls, stability balls, or exercise balls. These are potentially great for all students, not just ones with ADHD. Kids can twist a little bit from side to side. A rocking chair also works. Similar to swivel chairs or disk seats, these chairs let students rock within their seats. Teacher tip: don’t let students wobble too much, or they may fall off! These sit on a chair and allow students to rock in their seats (without being as dangerous as rocking the entire chair). Cushions can also work. Great for all students, not just ones that need to fidget. Learn how students brought standing desks into their classroom in this Edutopia community post: Using Stand Up Tables in the Classroom. If it’s within your budget, you can also use treadmill desks. A built-in footrest can help reduce the noise that would otherwise happen with foot tapping. Putting a stationary bicycle at the back of the classroom is a great way to help students be active, with the added benefit of exercise! Clear an area in the side or back of the room to let students stand, stretch, dance, pace, or twirl. If you’re brave, you can set up small trampolines for students to jump on. Students don’t have to do their learning at their desk. One student did his work at the windowsill, while another moved from one desk to another. Having different learning stations can benefit all types of students. For ideas on setting up your classroom, check out this post: 7 Learning Zones Every Classroom Must Have.